Much to the Europeans’ surprise, while holding up the NATO alliance as an “indispensable” institution, Pompeo also put the European Union on the list of outdated and unviable ones. These “shocking” comments wrapped up the past 12-month period, probably the most tense in trans-Atlantic relations since 1945. By the start of 2018, relations between the US and the EU were characterized by a great deal of uncertainty. On the one hand, in the US National Security Doctrine [ii] published in mid-December 2017, Trump finally reiterated Washington’s commitment to Article 5 of the North Atlantic (Washington) Treaty, which is something Europeans had been waiting for. He also promised to support America’s European allies against the imaginary “threat” from Russia and China, which he described as "revisionist countries" out to change the existing world order. On the other hand,the USNational Security Council’s view of the countries’ competition in the world conforms to Hobbes’ “all against all” principle. [iii] In other words, it rejects the idea of multilateralism, which is a fundamental principle the countries of “old” Europe stick to. Moreover, the entire world order that the US helped establish after 1945, is described as the source of a flurry of serious challenges to America. The Strategy section, devoted to the “world of universal competition,” makes no mention whatsoever of America’s “allies,” while the repeated mention of the obligatory "mutual benefit" of allied relations looks like an undisguised desire to "monetize" friendship. Washington’s practical steps made in 2017 left Europeans wondering about the price (in the financial sense of the word) Trump would expect them to pay for honoring America’s trans-Atlantic obligations. As a result, Europe was torn between the desire by a sizeable part of its establishment to retain the US leadership [iv], even at the cost of far-going concessions, and a growing disillusionment with the policy of its overseas partner. Trump supported the UK’s exit from the EU, and even threatened the British Prime Minister Theresa May with economic "measures" in the event of a "softer" Brexit. On June 1, Trump imposed duties on steel and aluminum imports from Europe and threatened to slap new ones – this time on imported European autos. During the G7 summit in Canada in June, President Trump tried to drive a wedge between the Europeans. Finally, during the NATO summit in July, Trump made it clear that if Europeans refused to “cooperate,” Washington could roll back its military support and even withdraw the US military contingent from Germany. Washington has also made it clear that he considers any further EU foot-dragging on defense spending hikes as a deliberate policy by Europeans, who view the United States as an unfailing guarantor of their security. During the first half of 2018, the Europeans openly pushed back against Trump’s insistence that his G7 or NATO partners accept the dramatic change in Washington’s approach to these pillars of the Western world, their goals and objectives. And still, watching the growing signs of US hostility, Europeans start asking themselves a virtually existential question, and that is where the current US Administration is going? Is this the beginning of a long-term trend, a fundamental change in US strategy, or a tactical zigzag meant to achieve some short-term goals? If it is the latter, just like it happened before, then will it be enough to just “wait it out”? If it is the former, will the EU opt for strategic autonomy as part of an increasingly amorphous, but civilizationally homogeneous West, or will it have to solve the colossal task of creating a full-fledged European "power center” that would interact with the US, mainly, if not exclusively, on the principles of "Realpolitik"? By mid-2018, more and more European politicians had realized that, in the wake of the Cold War, Washington’s policy in Europe was aimed at undermining Europe’s global competitiveness. The question is, however, to what extent the American establishment as a whole shares Trump’s stated goal of maintaining or increasing America’s dominance, even at the cost of economically destroying the “allies,” who are now being perceived by Washington as competitors. Trump's initiatives are clearly aimed against the very idea of European unity, which fuels European suspicions about his desire to implement the classic “divide and rule policy” in Europe. Having all these factors in mind, the EU’s overarching task was to work out measures to resist Trump’s four-pronged “geopolitical attack” in trade, defense, on Iran [viii] and migration policy. 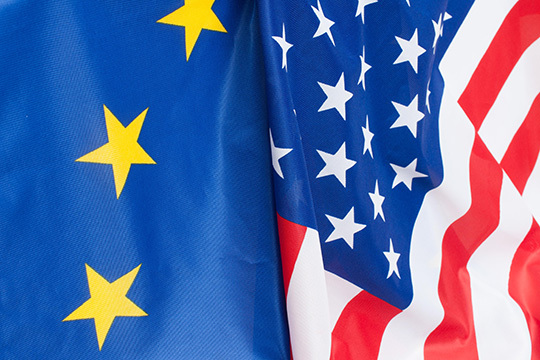 On June 6, the European Commission approved €2.8 billion worth of import duties on US-made goods. Following the July visit to Washington by the European Commission President Jean-Claude Juncker, the Europeans achieved at least a semblance of a “truce” in their trade relations with the US. Surprisingly to many, the reconciliation had a demonstrative, even flashy character. After meeting Juncker, Trump said that the US was putting on hold the planned introduction of new tariffs on imported European goods, and would work to settle existing trade disputes in order to avoid a full-scale trade war. According to experts, Europeans have no wish at all to share with the US the burden of a new economic slump, which Trump’s “reckless” protectionism may entail. Therefore, the EU could best respond to Trump’s policy by assuming the role of the leader of countries committed to preserving the rules of liberalism in international trade. The EU’s economic potential matches that of the United States and its economy is almost the only area of international relations where the bloc can act on a par with, or even independently, from Washington. Meanwhile, the traditional European parties are preparing to challenge Eurosceptics in the upcoming elections to the European Parliament, set for May 2019. Internationally, the EU responds by ramping up diplomacy aimed at cobbling together coalitions without the US in a bid to preserve the existing world order. In July 2018, the EU and Japan agreed to set up a free trade zone; Brussels has likewise been intensifying efforts to establish a free trade area also with MERCOSUR, Australia and New Zealand, and is actively engaged in informal efforts aimed at promoting liberal values and institutions. The EU’s stance concerning the US sanctions on Iran, has been equally firm, prohibiting companies and individuals located on the territory of the EU from following American sanctions against Iran. According to the new EU rules, European firms hurt by US sanctions will be able to demand compensation. Brussels also reiterated its commitment to the 2015 nuclear deal with Iran, and is actively looking for ways to circumvent US financial hegemony and sanctions. The EU is mulling an independent system of financial settlements, the European Monetary Fund - an analogue of the IMF - as well as financial instruments that would be "completely independent" from Washington. However, ensuring even a simple majority of “yes” votes by individual EU members on these issues will not be easy. The biggest hurdle here is security, because without the United States, NATO as a military organization becomes virtually ineffective making Europe hostage to America when it comes to security. This effectively weakens the EU’s hand even on the continent, let alone the world. The European NATO members face the hard choice of either playing the role of US-led partners, which may imply their agreement to weaken European unity to benefit Washington’s new foreign policy interests, or stay the course of greater independence, including in matters of collective defense (European army), which, however, is fraught with a great deal of uncertainty. During the past year, Europe was making mainly tactical steps aimed at making up for the damage caused by US sanctions. Simultaneously, it was actively looking for a future strategy of trans-Atlantic relations, as well as ways for institutionalizing its independent identity, both in foreign policy and defense. The outcome of the November 2018 mid-term elections in the US showed that American voters were losing faith in Donald Trump’s way of handling the country’s foreign policy and foreign trade. With Democrats regaining control of the lower chamber of Congress – the House of Representatives – Trump may need a positive foreign policy agenda, and what better way to achieve this than to restore constructive relations with traditional allies and negotiate with the Europeans? Including on joint measures to “contain” Russia. Simultaneously, the notion, whereby the EU project is on the brink of collapse and so the US needs to present NATO as a new unifier of Europe is getting increasingly popular in the United States. This is the idea that was pitched late last year by none other than US Secretary of State Mike Pompeo. This could pull the rug from under the feet of not only those who seek Europe’s strategic autonomy, but even the advocates of a more centralized EU. Therefore, the question of whether the leading European countries will go beyond pacifying voters with talk about the creation of an “independent center of power” remains open. And further moves by the EU in relations with the United States, at least until the May elections to the European Parliament and the change of leadership of the European Commission, will largely depend on Washington’s policy towards its European allies. The opinion of the author may not necessarily reflect the position of the Editorial Bpard. [viii] On May 8, 2018 the US exited the Iran nuclear deal, and in November reinstated full-blown sanctions against Tehran. Washington also threatens to sanction European companies maintaining business ties with the Islamic Republic. 795: 30 seconds to mars. Europe-US: results of 2018 and prospects for 201914 January 2019: Europe-US: results of 2018 and prospects for 2019! лучшие комедии. Europe-US: results of 2018 and prospects for 2019.